'A wonderful resource full of effective ways to minimize the stresses of parenthood and raise happy, unspoiled children' - Jack Canfield, coauthor, "Chicken Soup for the Parent's Soul". 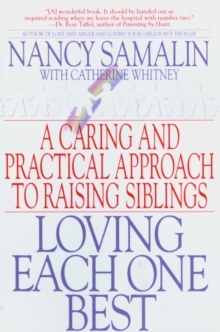 'Nancy Samalin's wonderfully wise book belies the notion that children don't come with an instruction manual. This is it! 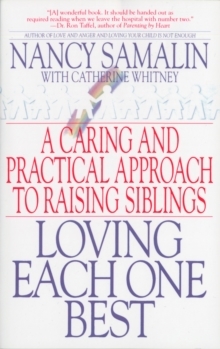 Her practical advice on setting loving limits takes parents well beyond discipline and provides lasting lessons in raising caring, confident kids' - Ann Pleshette Murphy, Parenting Correspondent, ABC's "Good Morning America," and "Mother Know How" columnist for "Family Circle". 'Wonderful advice with specific ideas to help in those frustrating parenting moments. Read it from cover to cover or flip through to find help with your problem-du-jour. Either way, these warmly shared words of wisdom will enrich your life as well as your parenting skills' - Vicki Lansky, author, "Feed Me I'm Yours", "Games Babies Play", and "Practical Parenting Tips".No parent wants to raise a spoiled kid. We want to raise children who are caring, compassionate, honest, and responsible. 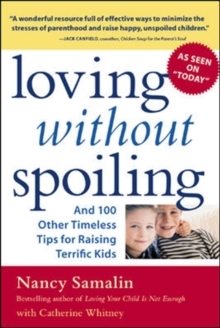 In "Loving Without Spoiling", bestselling author Nancy Samalin gives you effective ways to set loving limits without spoiling or overindulging your child, including: power struggles: tame the tantrums, stop the whining, set rules that stick; the communication gap: stop repeating yourself, keep it simple, connect with your kids; sibling rivalry: nix the tattling, get out of the fairness trap, minimize the fighting; and, everyday clashes: win the bedtime wars, avoid homework battles, diminish dawdling, cure the "gimmes".Nancy Samalin, M.S., is the bestselling author of Loving Your Child Is Not Enough, Love and Anger: The Parental Dilemma, and Loving Each One Best. She is the founder and director of Parent Guidance Workshops in New York City and has appeared on many national TV shows, including "Today," "Good Morning America," "20/20," "Dateline NBC," "CBS This Morning," and CNN. Catherine Whitney is a professional writer who has collaborated on numerous award-winning and bestselling nonfiction books. She lives in South Nyack, New York.